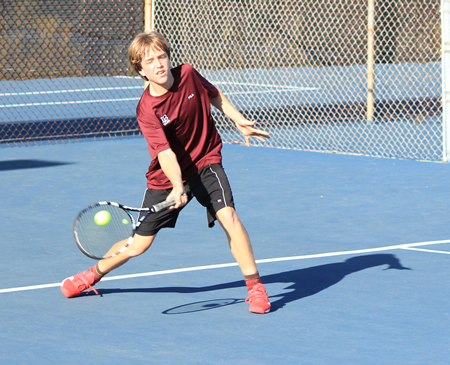 Freshman singles player Charles Keller helped Laguna sweep league foe Saddleback 18-0. Photo by Robert Campbell. Laguna lost 11-7 to Huntington Beach on Tuesday, March 17, as the squad dropped three very close doubles matches that proved to be the difference. Stuart Weiss won two singles matches and Ryan Gee teamed with Hayden Seitz and won two of three doubles matches. On Thursday, March 19, the Breakers defeated Mission Viejo 14-4, sweeping the doubles 9-0. Breakers had two league matches this week and will face Dana Hills in a non-league match on Wednesday, April 1. League play will resume on April 14.